Our Koyster turned 3! What better way to spice up the best combo (it's like numero uno on the menu... family-even from out of state & friends and a side of food...yah, I know. I'll take two please) then with SPIDERMAN! What a blast!! If you know me (which I'm sure you do since you're reading this blog) I heart parties, planning and watching all my hardwork come together for a memorable event. This was no exception...except for my limited time due to the million other things in life that happened instead of following thru on ideas or finishing projects. With that said, New York was a blast. That's where we had the party. 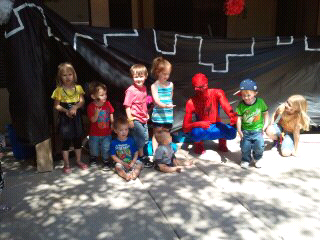 Koyer wanted Spiderman, so we had to travel to make it happen. Out of my boys, he would be the one to mostly get what he wants (remember I said he just turned 3...so we are leaving one terrible age to another...i'm saying that behind this smile on my face). It was a day full of fun! Games (villain bowling & go web go aka fishing for prizes), food, candy and snacks, cake, the amazing spiderman (magic, balloons-mostly swords, face painting, high fives), pinata, presents, watching balloons fly away...shall I keep going. The best part was sharing it all, being together and seeing all the smiles. Koyer is one lucky lil dude...thanks to you :) As I tell him to repeat me, "you're the best!" (and yes, usually there is "mom" at the end of that statement). 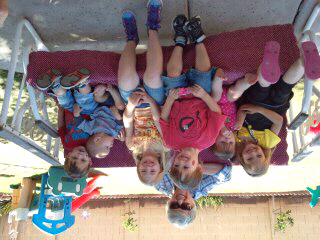 The boys were so happy to have Gramma Pat stay with us. What a treat! It is always fun to catch up. I like to ask about and hear old stories. So we stayed up late every night it seems. Good times. Today, April 6th, Justin turned 29! No, you're not going crazy. He has finally reached the age to maintain the eternal 29. Sad he's not home to enjoy all the celebrating we did today. Someone has to work, right? Don't you worry, we'll celebrate some more whenever he's home next. Well, that's all I got for now. Seriously we are blessed. We are so grateful to be blessed with the most loving and supportive people.